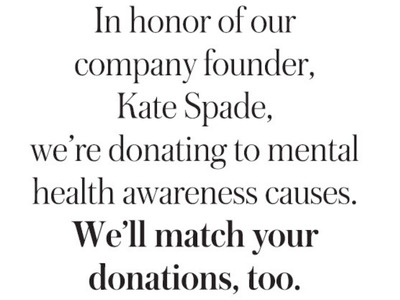 Kate SpadeKate Spade is donating $US1 million to mental health awareness. 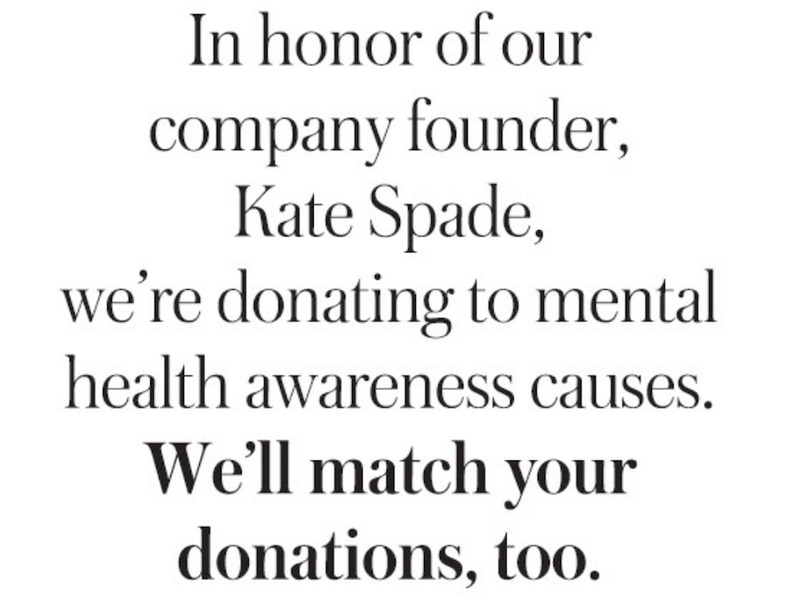 The Kate Spade brand announced on Wednesday that it would donate $US1 million to mental-health awareness to honour its late founder. Her husband, Andy, said she had suffered from depression and anxiety for many years. The first donation of $US250,000 will be given to Crisis Text Line, a non-profit that supports people in crisis using a text-messaging service. To honour its late founder, the Kate Spade brand is donating $US1 million towards mental-health awareness, it announced Wednesday. In an email to customers, the company announced that it would donate $US250,000 to the Crisis Text Line, a non-profit that supports people in crisis using a text-messaging service. It is also encouraging the public to donate by matching any of their donations up to $US100,000 between June 20 and June 29. So far, around $US16,000 has been donated by the public. The company did not immediately respond to Business Insider’s request for comment or confirm how the remaining amount of money will be donated. According to her husband, Andy Spade, renowned handbag-and-accessories designer Kate Spade had suffered from depression for many years. “She was actively seeking help and working closely with her doctors to treat her disease, one that takes far too many lives,” her husband, Andy Spade said in a statement to The New York Times after her death. While Kate Spade had not been a part of her namesake brand for more than a decade – she and her husband sold their last remaining stake to Neiman Marcus in 2006 – many still associated her with the brand and have been wondering what it will do to honour her legacy. The message was also posted in its store windows. Fans have taken to social media to show their gratitude to the brand for its donation to mental health causes. “This is why@katespadenyis the most amazing company,” one fan wrote on Twitter.